Completed in 1511, Raphael's "School of Athens" decorates one of four walls in the Stanza della Segnatura, one of four rooms in a suite of apartments intended for Pope Julius II. Now part of the Vatican Musuem, this academic gathering of history's most brilliant is accessible to everyone and it's wonderful! Photo: WikiMedia Commons. Welcome to the ArtSmart Roundtable! Each month, the Roundtable—a group of travel bloggers / art aficionados who are passionate about discovering art while exploring destinations around the world, publish this monthly series that highlights a particular art-related subject. January’s topic is wall paintings and when I think of wall paintings, I can’t help but think of the magnificent frescoes that decorate many a chapel, museum, city hall—among others, throughout Europe and the rest of the world. Topping my list of favorite frescoes are Michelangelo’s Sistine Chapel of course, but I’ve already written about the agony and ecstasy of the Sistine so I thought I would shift my focus to my second favorite Renaissance artist Raphaello Sanzio da Urbino or more commonly known as Raphael! 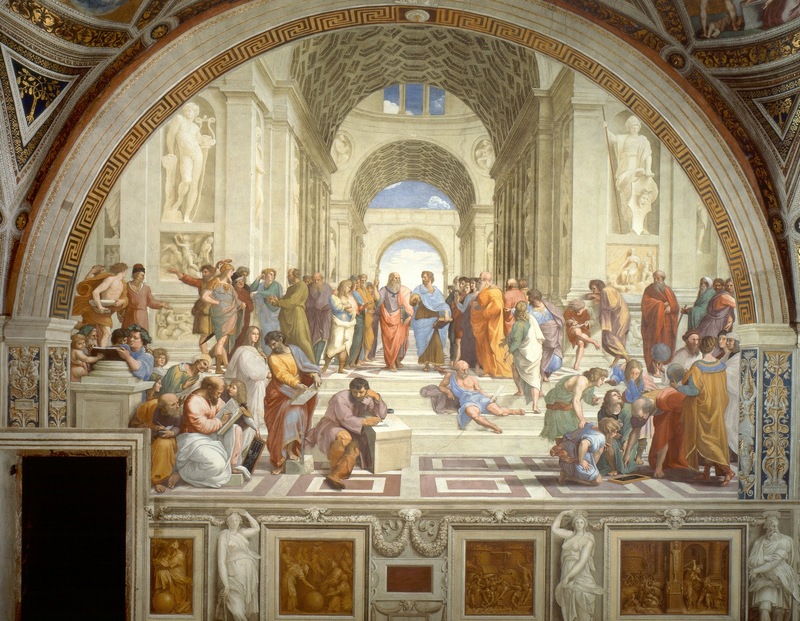 I hope you enjoy this closer look at Raphael’s “School of Athens” and the next time you’re in Rome, make sure you set aside time in your itinerary to visit the Vatican Museums to see this master stroke of genius up close and personal. Ever since Art History classes when my love affair with Renaissance was born, I have been captivated by Raphael’s frescoes in the Vatican Museum. 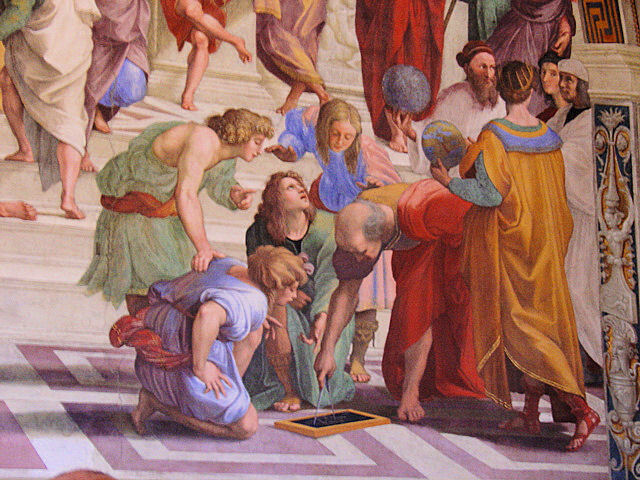 Decorating the walls of the Stanze di Raphaello or Raphael Rooms, specifically the Stanza della Segnatura, the “School of Athens” depicts a grand gathering of the most brilliant minds of ancient history—some personified by the leading artists of the Renaissance including Leonardo da Vinci and Michelangelo. Completed in 1511, 500 years ago, Raphael’s “School of Athens,” measuring in at a colossal 25' wide and 17' tall, hangs in what was intended to become a suite of apartments for Pope Julius II. Raphael, 25 when he arrived in Rome, was commissioned by the Pope to begin decorating the suite beginning with the Stanza della Segnatura. Actually the second of the frescoes to be completed after “La Disputa” on the opposing wall, the “School of Athens” depicts the school of philosophy and the love of higher learning. While many of the figures’ identities cannot be positively identified because Raphael never produced a legend for his painting, scholars have speculated based on their physical resemblance, save the few personified by the Renaissance masters; and the poses in which Raphael cast his leading men. However, we are certain about a select few including the painting’s central figures and even Raphael himself. 1: Zeno of Citium 2: Epicurus 3: unknown 4: Boethius or Anaximander or Empedocles? 5: Averroes 6: Pythagoras 7: Alcibiades or Alexander the Great? 8: Xenophon 9: unknown  or the Fornarina as a personification of Love  or (Francesco Maria della Rovere?) 10: Aeschines or Xenophon? 11: Parmenides? 12: Socrates 13: Heraclitus (Michelangelo) 14: Plato (Leonardo da Vinci) 15: Aristotle 16: Diogenes 17: Plotinus (Donatello?) 18: Euclid with students (Bramante?) 19: Zoroaster 20: Ptolemy? R: Apelles (Raphael) 21: Protogenes (Il Sodoma, Perugino, or Timoteo Viti). Photo: WikiMedia Commons. Ironically, the “School of Athens” is set within Roman architectural elements inspired by Constantine’s colossal basilica in the Roman Forum. Flanking the central figures in the background are two sculptures that reveal the inspiration for this setting: Apollo, god of archery, light and music, to the left and Minerva, goddess of wisdom, on the right. As for our cast of characters, it would take volumes to discuss each one pictured in the “School of Athens” so let me point out a few of the more noteworthy members of this academic congregation. I think you’ll find it fascinating to say the least. 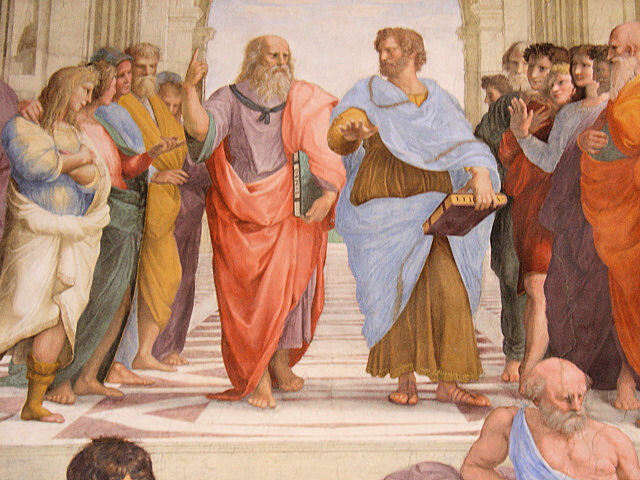 Plato and Aristotle, our leading men form the central focal point in Raphael's "School of Athens." Photo property of EuroTravelogue™. Unauthorized use is prohibited. Our central central focal point is comprised of our leading men: Plato and Aristotle. On the left stands Plato who is depicted as the great Leonardo and clutched in his left hand is his “Timaeus” while his right hand points toward the heavens—a symbolic nod to the book and its arguments for the physical world as well as the eternal. 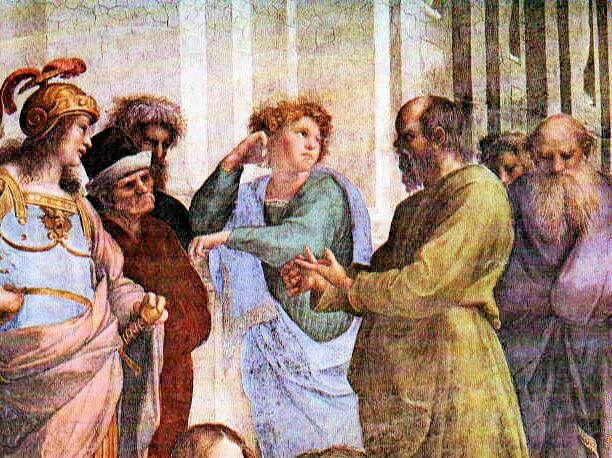 Standing next to him is the much younger Aristotle at the prime of manhood and in his left hand is his “Ethics.” His right-hand gesture symbolizes the positive spirit and the practical living of the here and now. To the left, we find the founder of western philosophy Socrates. Modeled after the famous marble bust of the first century, Socrates is seen here in his long green robe and gesturing toward Xenophon and other fellow philosophers. Socrates pictured here in the green robe is modeled after the famous bust dating back to the first century. Photo: WikiMedia.org. Francesco Maria Della Rovere is pictured here in white flowing robes. Some scholars believe this figure represents the manifestation for the 'love of higher learning.' 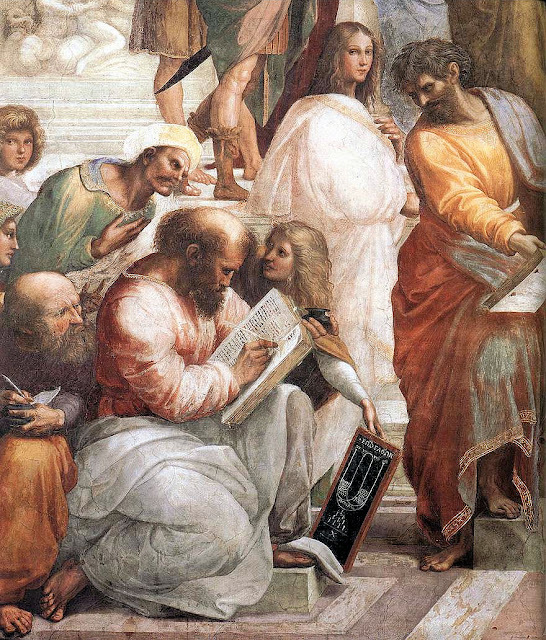 In front of Francesco, is Pythagoras teaching from his book. Photo: WikiMedia.org. Moving down and a little further to the left, we find Pythagoras shown seated and teaching from with book. A philosopher and mathematician, Pythagoras is most famous for his Pythagorean Theorem in geometry. [Suddenly horrific flashes of my dreaded high-school Geometry classes flood my mind]. Toward the center and at the same level, we find Heraclitus, the “weeping philosopher.” Aptly named because of his lonely life and his contempt for humankind, [Reminds me of Scrooge] Heraclitus is personified by none other than Michelangelo. 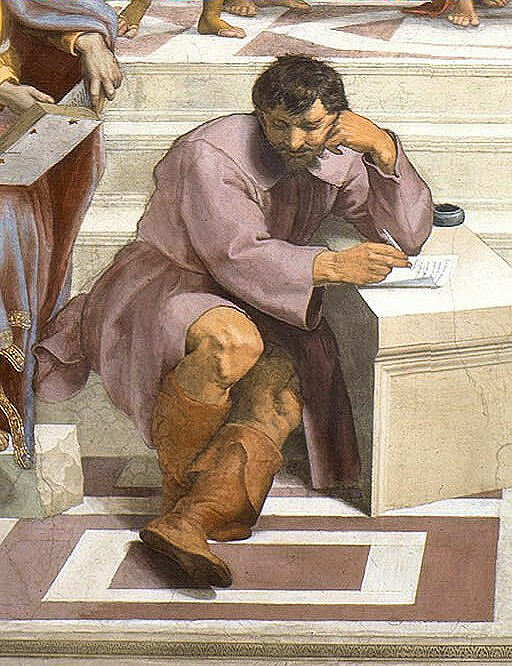 Originally, Heraclitus was not included in Raphael’s chalk cartoon but added later in tribute to the great Michelangelo after having seen his work on the Sistine Chapel. Heraclitus, the “weeping philosopher”; so called because of the lonely life he led and his contempt for humankind, is personified by none other than Michelangelo. Photo: WikiMedia Commons. Still at this lower level and to the right in a hunched-over position, we see Euclid, the “Father of Geometry” in his crimson robe and holding his compass. What’s particularly fascinating about this figure is that he modeled after Bramante, the architect hired by Pope Julius II to complete Saint Peter’s Basilica at the Vatican, and the person responsible for bringing Raphael to Rome in the first place. If you look carefully at the back collar of his tunic, you will find Raphael’s signature: R.V.S.M. meaning Raphael Urbinas Sua Manu. Euclid, pictured here, takes on the physical characteristics of Bramante, Pope Julius II's master architect overseeing the completion of Saint Peter's Basilica. Photo: Property of EuroTravelogue™. Unauthorized use is prohibited. 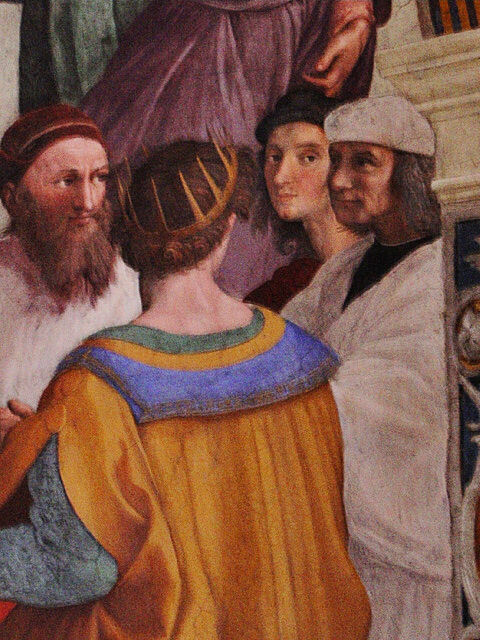 Last but certainly not least is the master artist Raphael himself who makes an appearance in the lower right standing behind a group of scholars nearest to the edge of the scene of the painting. He’s the only person peering directly out to the viewer—rather uncannily at that. Raphael peers directly out to his audience in the "School of Athens" fresco inside the Vatican Museum. Photo property of EuroTravelogue™. Unauthorized use is prohibited. I hope you enjoyed this introduction to Raphael’s “School of Athens” at the Vatican Museum in Rome! If you want to see and find out more about this masterpiece and the rest of these scholarly gents, visit the Vatican Museum for an amazing virtual tour through the Stanza della Segnatura and the rest of the Raphael Rooms. The Cyclorama in Atlanta by Erin Halvey. Frescoes in Florence, Italy by Jenna Francisco. Frescoes, Wall Art and the Test of Time by Kelly Goodman. Fresco Rescue and the Problem of Venice by Leslie Guettler. Raphael is one of the artists I really really admire. Marlys, I couldn't agree with you more!! I have a fabulous book filled with all the images and information on Raphael's and Michelangelo's work in the Vatican. Thank you for stopping by and sharing your love of Raphael! Fantastic post, very interesting to see the details of this fresco by Raffaello, he certainly is one of the greatest Italian artists. This particular fresco continues to amaze me every time I see this incredible compilation of ancient history's greatest thinkers. Raphael certainly was accomplished in many areas at such an early age. Thank you so much for stopping by and sharing your thoughts!! Thanks for the great closeups! Love how the fresco invites you to walk right into it, up the stairs, through the crowd, on and on out through those arches...gorgeous. Hi Lesley! I couldn't agree with you more!! I love to get lost in this particular fresco that has fascinated me since college. I still can't get enough. Thx for stopping by to share your thoughts!! One of my favorite pieces!! I viewed it in person last November, and it will forever stay with me... thank you for making it even more alive! How did you view this? Was it included in your Vatican visit? I'm going soon and wondered where I get this ticket from. Thank you. Hi Kim!! Mine too!!! It really inspired me to pursue my studies in Art History and I have Raphael to thank for that!! Thank you for stopping by and sharing your experiences. By the way, love your site by the way...life doesn't get better than that combination! Beautiful! A wonderful post that brings me back to the Vatican once again. Rafael is one of those artists that you "wish" you could dislike because he is so popular. But once you lay eyes on this mammoth fresco it's hard not to want to find out more and more. Barbara, I couldn't agree with you more in your last statement above. I fell in love with his work in my art history class and have been on a mission since to discover his legacy. Thank you so much for stopping by and sharing your thoughts! Awesome this are. The paintings are superb and of course, inspirational. I wished I can fly to Rome and see this. By far, I only see them on the books while studying Roman history. Hi there Doc and thanks so much for stopping by to share your thoughts. I agree, this and the rest of the Raphael rooms inspired my love of art and to finally see these in person, after seeing them only in books like you, was one a dream come true! Despite popular belief, it is unlikely that the fresco contains a portrait of Michelangelo as Heraclitus. Raphael and Michelangelo were fierce adversaries. It is far more likely that the figure of Heraclitus was meant to outmaneuver Michelangelo rather than praising him. Raphael would have been able to observe the Sistine Chapel ceiling before it was publicly displayed, and might have inserted a bulky, muscular Heraclitus to broadcast a style that Michelangelo was developing behind closed doors. Raphael was a synthetic artist, always interested in absorbing new aesthetic ideas, but he was also a shrewd man who actively wanted to outdo his rivals. Later on for example, in an informal competition between Michelangelo (through Sebastiano del Piombo) and Raphael, the latter drastically altered his Transfiguration after seeing Michelangelo and del Piombo's Raising of Lazarus. Hi there Javier and thank you so much for stopping by! Your insight into Raphael's competitive nature really adds a lot to my article and I thank you for taking the time to share your views on the subject. Comments like these add so much value for my readers thus adding credibility to the site and for that, my sincere thanks! Vatican Museum is so embued with fine art and masterpieces that it takes you long to visit it properly,isn't it?Lovely masterpiece which sends you back in the 15th-16th. I am very fond of Rembrandt's canvas too. Hi Diana and thank you so much for stopping by to share your thoughts. I couldn't agree with you more about the Vatican. I could spend days there. Sadly, most visitors rush to the Sistine and miss out on most of this extraordinary collection! Drawn to your post after a very interesting reading: "The Cave and The Light" by Arthur Herman. A deep scholarly book which proposes to reveal how the contrasting worldviews of Plato and Aristotle have battled for our attention and are still very much alive and all around us today. Hi there Dan!! How fascinating!! I must look up this book right away and read!! Undoubtedly, their philosophies are still with us!! I bet it was a fascinating read! Thank you so much for stopping by to share your thoughts! I really appreciate and love to receive comments like this!! They break down fats easily and do not allow them to accumulate. I'd suggest this for people that have twenty pounds or less to lose. these weight loss diet pills remove the toxic and the harmful substances perfectly from the body.